For other uses, see Evan Roberts (disambiguation). 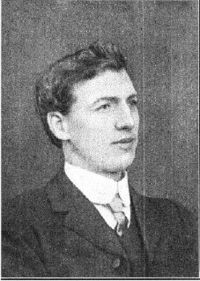 Evan John Roberts (8 June 1878 – 29 January 1951), was an Evangelist and leading figure of the 1904–1905 Welsh Revival who suffered many setbacks in his later life. "He was a man who had experienced strange things. In his youth, he had seemed to hold the nation in the palms of his hands. He endured strains and underwent great changes of opinion and outlook, but his religious convictions remained firm to the end." Born in Loughor, Wales, Evan Roberts was the younger of two sons born to Henry and Hannah Roberts. Raised in a Calvinistic Methodist home, he was a devout child who attended church regularly and memorized scripture at night. From the ages of 11 to 23, he worked in the coal mines with his father. Reports indicate that an explosion occurred as he assisted his father in the mine, scorching the Bible he diligently read. Evan then spent time working for his uncle as a blacksmith's apprentice in Pontarddulais. Roberts was widely known as a young man who spent many hours praying each week both personally and at group prayer meetings. Several character studies have noted his unusual zeal and warmth of character. His prominent involvement in the Welsh revival followed a period of religious awakening across the region, but most biographies assert that its spark seemed to fly from Roberts. He reported having experienced visitations from the Holy Spirit depicting "all Wales being lifted up to Heaven," at one time asking his roommate (and later brother-in-law) if he believed that God could then "give us 100,000 souls." Within a few months of October 1904 this was indeed the case. The numbers of conversions were chronicled daily in the Western Mail, the National newspaper of Wales. Famous journalists, preachers, and even the future Prime Minister Lloyd George, vouched for the genuineness of the revival and of Evan Roberts. In 1904, Roberts began studying for the ministry at Newcastle Emlyn. Attendance at a service held by evangelist Seth Joshua in Blaenanerch, Cardigan led to an experience that formed Roberts' belief in the "Baptism of the Spirit". In October of that year, Roberts began speaking at a series of small meetings. These appearances led to his involvement in the Revival. He was soon attracting congregations numbering thousands. Within two weeks the Welsh Revival was national news and before long, Evan Roberts and his brother Dan and his best friend Sidney Evans were travelling the country conducting Revival Meetings. In one of the most carefully chronicled of all revivals there are common themes. People gathered in large numbers with a sense of expectancy. Meetings lasted hours but from the beginning there was a sense of conviction of sin. Wrongdoing was confessed and lifestyles were affected. The pubs went from full to empty. There were thousands of conversions that brought tremendous joy. Some of the toughest characters in the valleys were converted. It was a revival that especially was begun and sustained by the young. It is said that thousands of these men died in World War I, 10 years later. Despite the success of the Welsh Rugby team in their most successful year so far, Evan became perhaps the most famous man in the world, at the time because of worldwide excitement about his preaching. Prayer meetings gathered huge crowds. Sporting events became less important. In Trecynon, Evan would walk from one packed church to another all within a few yards of each other. This pattern became the norm. Yet he refused celebrity status and gave away his money. He refused the evangelistic effort to be about him. By now revival was all over Wales and was not reliant on Evan's being present. One of the most famous stories is of the pit-ponies not understanding the miners' commands as their language was cleaned up! He brought a youthfulness with new songs being sung especially by the "singing sisters". He preached more than is sometimes reported though not always the case. He would sometimes agonize for hours before saying anything. He certainly carried an intensity to all he did whilst remaining beloved in Wales. He would often stay with the worship services into the early hours and still wake early to pray and invite men at the pit-head to the meetings. Roberts soon succumbed to the pressure of his rigorous schedule, and, in 1906, suffered a physical and emotional collapse. Evan retained his faith though clearly suffered from depression. He found some solace in writing poetry. A number of letters reflect that he retained his deep faith. He developed a discipline to his life as he turned to prayer as his main ministry. Though a Welsh speaker, Evan convalesced in England, at the home of Jessie Penn-Lewis. He lived in Brighton for some years from 1921. People longed for Roberts to return to Wales. But he became convinced that the work of intercession was vital. He gave himself to prayer and believed that he reached more this way. There are several accounts of how he continued the mission especially on his knees and with his publications (co-authored with Penn-Lewis) that encouraged the missionary growth of the 20th century. Some felt hurt that he had somehow abandoned Wales. Penn-Lewis, an evangelist deemed apostate and heretical, tried to convince Roberts that some of the signs and wonders that occurred during the revival were not of God. She even forbade entry to visitors and friends wishing to see Roberts. Accusations of his having no theological or ministry training may have hindered his ability to stay on track amidst a clamor for his time. But there is no doubting the remarkable sense of the presence of God in his ministry. He returned for his Father's funeral in his hometown of Loughor, South Wales, where the revival began. He spoke a few sentences and a "mini-revival" sparked in 1928. He lived out his last years in Cardiff and in effect died in obscurity. The 100-year anniversary of the revival brought fresh appreciation for this gentle individual who helped set Wales on fire. The revival was undoubtedly of great influence, and many Welsh seek its recurrence. Evan Roberts died in 1951 at age 72. He was buried in a family plot behind Moriah Chapel in Loughor. A memorial column commemorates his contribution to the revival. While writing his 1907 dystopian novel Lord of the World, Roman Catholic priest Monsignor Robert Hugh Benson drew upon Evan Roberts and the 1904–1905 Welsh Revival as models for the reign of the Anti-Christ. The story of Evan Roberts and his role in the 1904–1905 Welsh Revival was adapted into a successful stage musical by Mal Pope called Amazing Grace in 2005. Invasion Of Wales By The Spirit Through Evan Roberts, James A. Stewart, Revival Literature, 1963. God's Generals, Roberts Liardon, Whitaker House, 1996. ^ , National Library of Wales : Dictionary of Welsh Biography. (Rev. Gomer Morgan Roberts, M.A.) Retrieved on 2015-08-21. ^ Evan Roberts. 100 Welsh Heroes. Retrieved on 2013-03-24. ^ Evan Roberts. Welsh Revival (1904-09-29). Retrieved on 2013-03-24. ^ C.C. Martindale, S.J. (1916), The Life Of Monsignor Robert Hugh Benson, Volume 2, Longmans, Green and Co, London. pp. 65-66. ^ 'Amazing Grace' returns to Swansea for November 2011. Malpope.com. Retrieved on 2013-03-24. This page was last edited on 14 April 2019, at 13:48 (UTC).